The animal supporters on coats of arms fall into two categories: those that are mythical beasts and those that are stylised representations of real animals. Lions on coats of arms often appear so stylised that they resemble no known lion and look like some entirely mythical beast instead. For me, the real animals fall into two categories: those that I recognise, and those whose names or species I have to look up. If I post a design with unusual animals, I will be sure to add their names. Coats of arms have a long history, as do those with animal supporters. They appear on coins old and new, all over the world, so we are sure to find lots of them. Artists take great pains to capture the details of their subjects, with superb results, as you can see from some of these designs. Often, though, in their search for perfection they force their models to pose for hours on end. When you see these two sailfish, on the Seychelles coat of arms, out of the water and standing up, you may wonder how the artist managed to persuade them to pose like that. All I can say is: no animals were harmed during the making of this topic. Uganda. A kob and a crested crane. A splendid lion and dragon from British Hong Kong. It must have been difficult to stop them trying to kill each other. Australia. Round 50 cents pattern coin of 1966. Bahamas. A marlin and a flamingo. Chile. A huemul and a condor. Britain has the lion and the unicorn. Due to global warming, I see them in the garden occasionally. They're too hard to catch, though, so I don't bother eating them. The states of Bremen and Hamburg both had two lions on many of their coins, until the end of the monarchy in 1918. (Or, if you include notgeld, until 1924/25.) Here is an example from Hamburg. 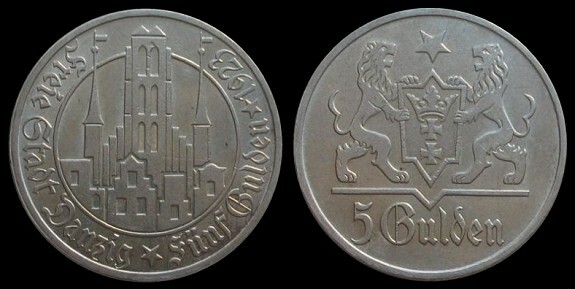 More lions, this time from Danzig (image from worldcoingallery.com). The city (today Gdańsk, PL) still has that CoA, but coins like this one were issued when the place was a Free City between 1920 and 1939. Hannover, 1 Thaler, 1866. A lion and a unicorn, I believe. Excellent design. These beasts have such personality! Contrary to the lion in your garden and on that 50p design, this one looks like ... I don't really know ... a lionpoodle maybe?